The maternity picture of this couple was taken in a gorgeous nature park in Bridgeville, PA. Mom and dad were engaged in some expressive posing here with mom at 39 weeks when we took this photo, so the new addition to their life was mere days away! 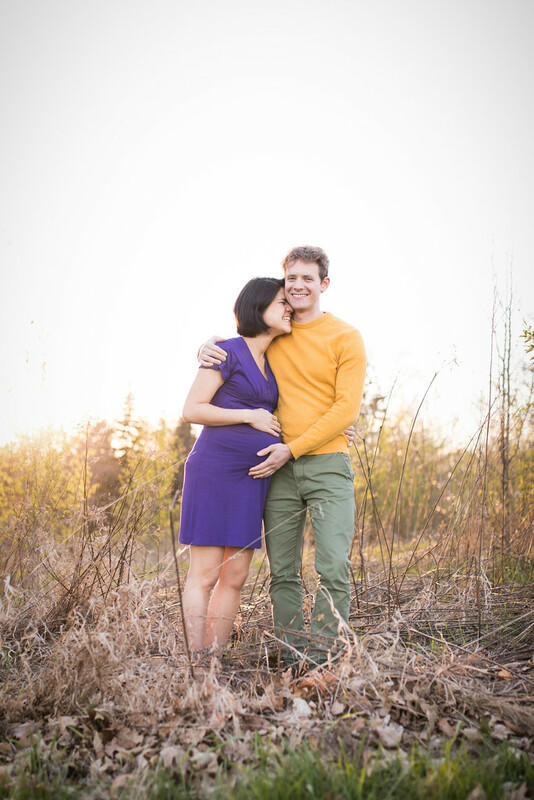 Different seasons can provide all sorts of beautiful natural backgrounds (and foregrounds) for maternity pictures. Looking at this portirait, due to the state of vegetation, you would think this was taken in the fall. If that was your thought, well you were fooled! This was actually taken in early spring when we had a welcome break from the winter doldrums. Many would probably overlook areas with dead/decaying vegetation; however I have found these areas provide some of the best environments for maternity photos. The neutral appearance of the vegetation often provides a really nice contrast to the subjects. Here I used the time of day to position them to create appropriate backlight. This can be seen in the halo effect which defines the edge of the subjects. I used a fill-flash to help manage the excessive and awkward shadows that often accompany backlit pictures.